In this post, we'll go through the few steps that will allow you to implement both authentication and authorization security features in a Spring MVC application. We'll use the Spring MVC demo application we've developed in a previous post as starting point. Feel free to take a look at it first (here's the post), if you want to follow the steps below one at a time. You'd rather get down to business right away? Here are the sources of this application (pick the master branch). Once we add Spring Security features, unlike basic Spring MVC applications (in which, by default, the DispatcherServlet initialization will look for a file named [servlet-name]-servlet.xml in the WEB-INF directory), we'll need to explicitly define a ContextLoaderListener listener as well as a context parameter named contextConfigLocation whose value is the relative path to your Spring configuration file, in the web.xml file. Then, yet in the web.xml file, we'll add Spring security filter definition so that requests that are sent to our dispatcher servlet will first be intercepted by this security filter so that authentication/authorization can be checked against the request content, origin, and so on. At the same time, we'll define an URL mapping to this security filter to specify which requests we want to have the security filter intercept and process. In this step, we'll edit our Spring configuration file (that we've defined as being the MyDispatcherServlet-servlet.xml file back at the step 2), and configure the security features we want to use, that is, we'll configure authentication through a login page, and authentication through access right that the user must have in order to access a certain page. In the <security:intercept-url> element, we specify the URLs whose access should be restricted to users with the role(s) that we specify in the access attribute. In this example, we are basically saying that a user should be authenticated (he must log in through the default login page) and hold the ROLE_REGISTERED_USER role in order to access the "home.go" page. In this example, we simply hard coded the usernames, their associated password and roles directly in the Spring configuration file. 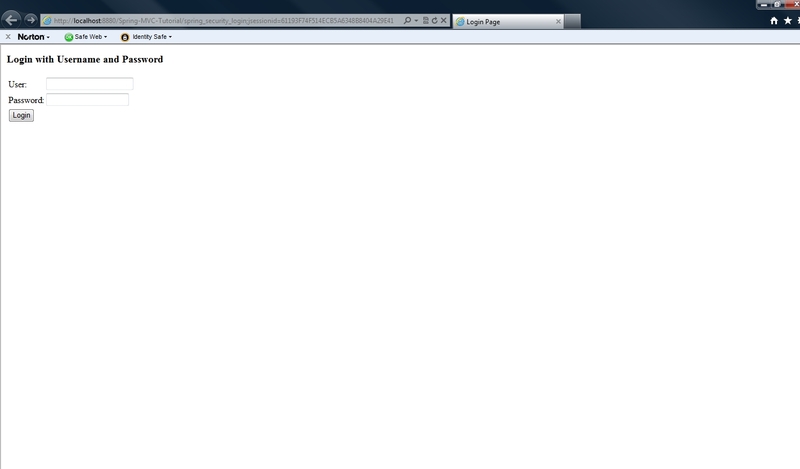 Once the application is deployed, try to access the home.go page and you'll be redirected to the default login page. 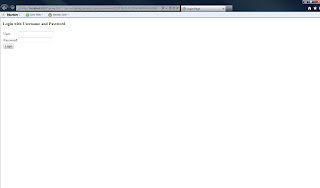 Try to login with wrong credentials: you'll be redirected to the login page but take a closer look to the address bar. See the "spring_security_login?login_error"? This is the default behavior of Spring security when relying on its generated login page, to redirect the user to the login page and the login_error parameter is used to detect that the previous login attempt failed, so an error message must be displayed. On the login page, log in using the following credentials user1/demo. As the "user1" user has the ROLE_REGISTERED_USER role that is required to access the home.go page (remember the roles we've defined at step 3? ), you'll be successfully directed to the required home.go page. From the previous page, click on the logout link to get back to the login page, then log in with the credentials user2/demo. As user2 only has the ROLE_FREE_USER role, we'll get an HTTP 403 ERROR page indicating that the user is not authorized to access the required page. The source code of this example project is accessible here.